Upon entering any classroom at Montessori Children’s Schoolhouse, you will observe a child-centered environment with a diverse group of students actively engaged in a variety of learning activities. A child might be on a floor mat with manipulatives designed to assist in the understanding of numbers and math processes. Another child might be at a table arranging a “moveable” alphabet into words or sentences to strengthen his understanding of the relationship between groups of letters and sounds. 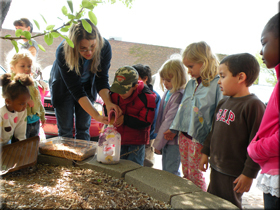 A small group of students might be gathered around the teacher as she introduces them to the various parts of an amphibian. Elsewhere in the classroom, students are working on tasks that promote daily living skills, sensorial awareness, language arts and reading, mathematics, geography, general science, botany, and zoology. The role of our Montessori-trained teachers is to design and prepare stimulating and enriching environments that encourage each student’s creativity and exploration. We design these environments to challenge our diverse student population and to encourage them to develop independence and a love of learning. Our teachers are the connective link between the students and their environment. They provide warm and sensitive guidance to encourage each child to achieve his or her own potential. Our classroom communities strive to work together as a family unit. The social, emotional, physical and cognitive strengths and weaknesses of each student are accepted as “norms” in the environment, not as points of comparison. The Montessori philosophy encourages children to develop a sense of self-worth; each child works at his or her own pace to develop and enhance skills. Montessori Children’s Schoolhouse places a strong emphasis on “basic” skills. Our three-year learning cycle allows children to progressively build skills, knowledge and understanding. The mastery of skills is not the end, but rather the beginning point of an endless search for knowledge. Here are more reasons. Check out these videos!